I can't say that this is 100% authentic. I haven't been to Brazil (although I am working on it). 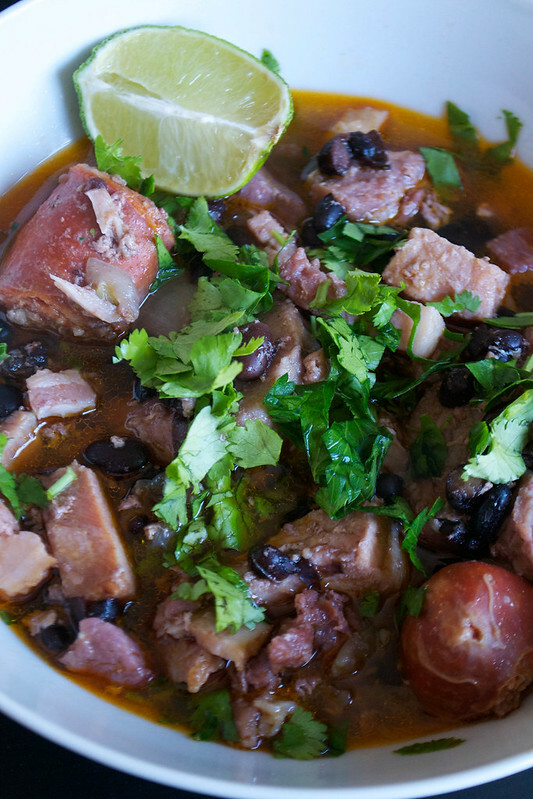 What I can say is that it's the end result of tweaking other Feijoada recipes until they worked for me, adjusting and tinkering as I went, until I ended up with something completely different. First, I tried Alan Rosenthal's version, from the book Stewed!. In it, he uses chorizo, pork shoulder, gammon and smoked bacon and suggests serving it with orange slices and freshly-chopped coriander. The stew was delicious but a bit salty for my taste, and so I've taken out the gammon and just kept in the smoked bacon lardons, adjusting quantities of the rest of the meats accordingly. And then there was a recipe on the Allrecipes website that I tried. It used bacon but didn't have the lovely big chunks of pork shoulder or the chorizo that I loved in Alan's version. The chorizo is especially important, as it colours the broth a warm amber and gives the stew a smoky-sweet flavour. And it was scattered with a combination of parsley and coriander. That bit I really liked. So I kept it in. I also wanted to leave the stew in the slow cooker bubbling away all day. I don't like to have the oven blaring when it's hot outside, and this way you can come and go all day without worrying about when you're going to put dinner on. You just eat when everyone gets home. And I've used tinned beans instead of dried ones. This really is an unfussy, uncluttered version. You just chuck everything into the crockpot and scoop it all out to eat 4 hours later. So this is it: my version of the Brazilian stew Feijoada. You can use beef instead of (or as well as) pork shoulder if you like. But you need the smoky chorizo and the bacon. Trust me. Put your crockpot on to high. Heat the oil in a frying pan and gently cook the garlic and onion until softened but not browned - about 5 minutes. Add to the crockpot. Next, fry the bacon lardons until the fat starts to render down and they turn slightly golden and then add the pork shoulder pieces. Continue to cook until the pork is lightly golden and then add to the crockpot, along with the chorizo sausages. Add 150ml water to the pot, give everything a stir, and replace the lid. Leave to cook for 3 hours. When you've only got one hour left for the stew to be cooked, tip in the beans to warm through. Allow to finish cooking for the final hour. When the stew is ready to serve, the pork shoulder will be tender and the broth will be a warm amber colour. Ladle into bowls and pour over some of the liquid in the pot. Scatter with the chopped coriander and parsley and squeeze over the lime juice just before serving. I eat this plain, in shallow bowls, but you could serve it with some rice - how about some lime and coriander rice alongside?